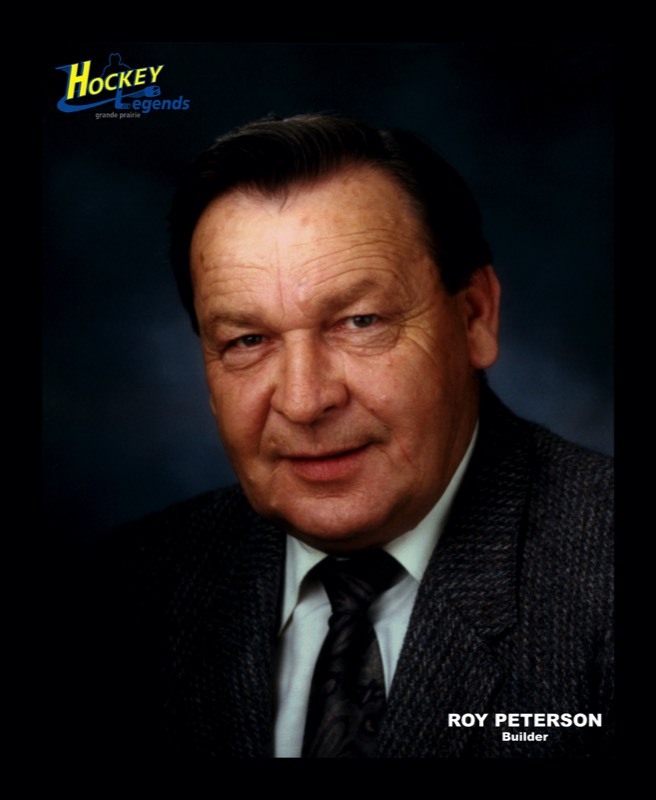 A call from Rick Peterson, GP Hockey Legend Roy Peterson’s son informing Stan that his father had passed away. Rick went on to ask Stan if he would address Roy’s friends and family at a memorial he was planning. Roy was eighty-six. Roy and Stan’s favourite uncle were neighbours and close friends when Stan was in elementary school. They were adult role models for him and through that early connection Stan had inside information about the winter recreation facility and minor hockey program Roy was working on. After playing through the minor hockey program Roy had designed, Stan lost touch with Roy. Half a century later he had the privilege of interviewing Roy as a GP Hockey Legends candidate. It marked the renewal of a close friendship until Roy’s death. As one of the first Legend inductees, Roy was an encyclopedia of information for the Legends project, always ready to share his memories but a reluctant celebrity as viewed by Stan and others who knew him. Following is Stan’s tribute to the Father of Grande Prairie’s Minor Hockey program. It’s been 57 years since Roy Peterson dropped the puck on an outdoor rink on the Bear Creel Flats marking the beginning of organized minor hockey in Grande Prairie. I will share with you a few memories and thoughts about a man and his volunteer activities that spanned more than half a century. Roy spent his early years on a farm in Manitoba. He learned very early that dishonesty does not pay off. It was during WW 11 and three older siblings were in the Canadian militia. Several times Roy tried, unsuccessfully, to convince army recruiters that he was old enough to join his brothers. Fortunately rejection by military recruiters did not squelch Roy’s fundamental altruistic nature. Before making Grande Prairie home Roy served as an RCMP officer in Saskatchewan and Southern Alberta. He moved to Grande Prairie with his family in 1954 accepting a position with the Provincial Highway Inspection Dept. Roy was convinced about the inherent benefits of sports as a vehicle to develop the potential of young people. Shortly after arriving in Grande Prairie Roy joined the Volunteer Fire Dept. where he aligned with colleagues that shared his beliefs and values about young people. Hockey became the platform for Roy and his friends to give substance to their beliefs about guiding young people through childhood and their turbulent adolescence years. The goal of Roy’s minor hockey initiatives predates but is reminiscent of the RCMP’s National Youth Strategy reported in their website as “… increasing youth awareness and influencing youth through behaviour modeling, mentoring, active learning while engaging them to positively influence their peers, school and community.” I was fortunate to be among the young people to benefit from Roy’s activities.